Over the past few years I have done quite a few distance races. At each race at a minimum I get a new race shirt. I browse the expanse of vendor booths set up at the expo and might pick up a few more things. From when I started running to now, I’ve had to develop a new strategy for shopping at the expo. When first started running, I wanted everything and my shopping reflected that. I would pick up far more than what I needed. The result, my dresser drawers are bursting with shirts, shorts, and other running gear. Now I go into an expo knowing what I need to pick up and quickly breeze by the other booths on my way to the necessary stops like packet pick up. It’s been a pretty successful strategy. This year at the Disney Princess Marathon expo, I knew the places I wanted to hit, Official Merchandise, Sweaty Bands, Packet Pick Up and we were going to done. As I was cruising past the vendor booths I spotted a shirt that jumped out at me. Jim had decided to check out sunglasses so I double backed to really check it out. 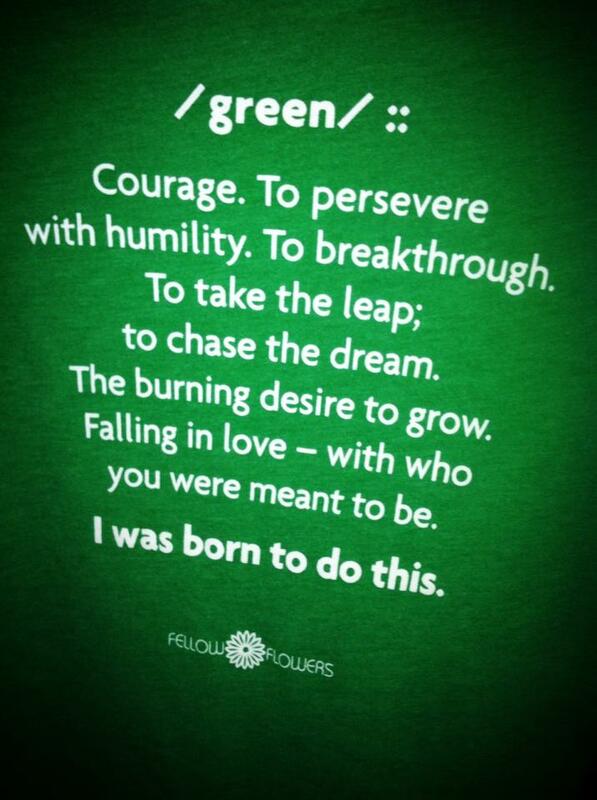 It was a Kelly green shirt with the word courage printed on the front. The back of the shirt was a definition of courage that really resonated with me because it read, “to persevere with humility” and “falling in love with the person you were meant to be”. Courage was word in my vocabulary but it wasn’t that important to me until I started working with the Navy. I am Coast Guard, and about a year and a half ago I started working with the Navy at their Senior Enlisted Academy. The core values for the Navy are Honor, Courage, and Commitment. During each class we discuss what the core values mean to the students. Listening to the students definitions made me really explore what courage means to me. In the military, the word courage is often synonymous with courage in battle. Showing bravery when the enemy is near. While that is an important facet of the word, for me courage is much more than physical courage. My definition of courage is still evolving, but here is what I believe courage is. Courage is when you are not afraid to be vulnerable, totally exposed to criticism. Courage is putting it on the line, risking it all (especially when the outcome is uncertain). Courage is trying something new. Courage is doing something that others tell you it is stupid. Courage is staying true to you. Courage is looking for the truth, even when the truth isn’t pretty. Courage is doing what you believe is right and not about always being right. Courage is treating everyone with respect, even the people many others don’t want to see. Courage is standing up to bullies. Fellow Flowers (http://fellowflowers.com) makes this shirt. Their story is just as inspiring as the t-shirts. In 2011 a group of women started training for a half marathon together. Over the course of their training, they discovered that running is much more than just running; it is a journey of mental and physical struggles. It is a journey where you face your own fears and adversity and hopefully in the end, when you cross the finish line you will have learned something that you can apply in other areas of your life. 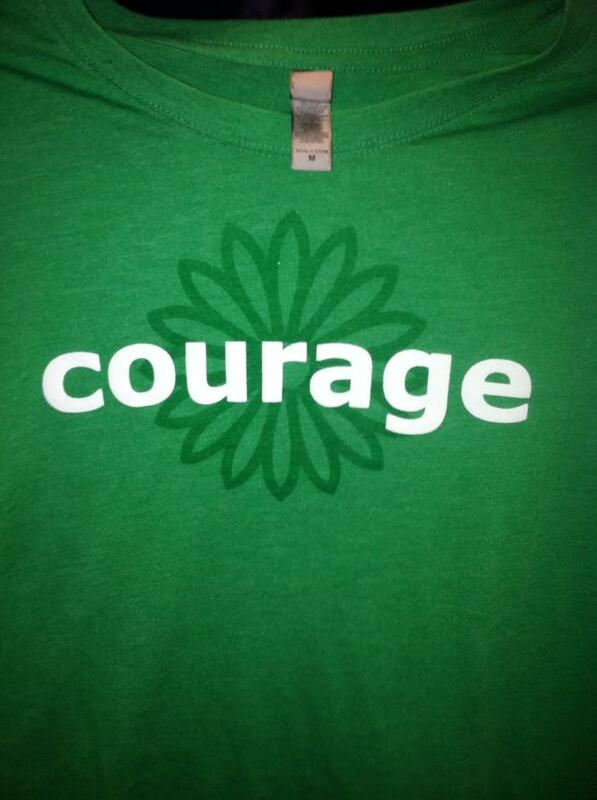 My courage shirt is now one of my favorite shirts because it reminds me what courage means to me. But more importantly it reminds me to live my life in a courageous way. Now if Fellow Flowers would only make a shirt defining honor and commitment, then I would have a complete set of Navy core value shirts.